Accessories: Accompanied by Rolex guarantee stamped Artland Watch Co. and dated August 10, 1957, Artland Watch Co. polishing cloth, "Submariner" card and presentation box. Introduced in 1955, reference 6536/1 replaced reference 6536 and remained in production until 1959. Today, it is one of the most sought-after vintage Submariner references due to its design and modern proportions. Preserved in stunning and exceptional condition, this reference 6536/1 is an incredibly original and well-preserved example. Boasting thick bevels, a robust case and strong proportions, it is evident that this timepiece has seen extremely little, if any intervention throughout its lifetime. 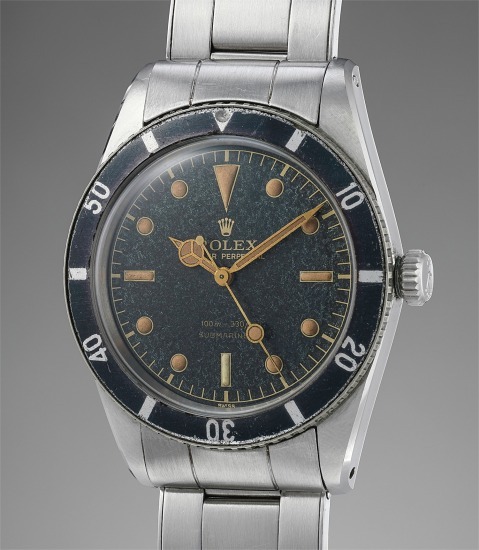 The dial is preserved in equally excellent and impressive condition. The luminous marker at 6 o'clock is most notably much brighter than the other lume plots. This feature allowed divers to orient themselves in the dark. Other impressive features are the original bracelet, stamped for the fourth quarter of 1956, along with the original Brevet crown. The timepiece is further enhanced by its original guarantee, stating the watch was originally sold at Artland, Hong Kong. It is even accompanied by its original Artland Watch Co. polishing cloth, adding another layer of collectibility.